The operas of Paisiello enjoyed much popularity during the composer’s lifetime and established a high profile which lingered for some considerable time. Indeed, his pioneering Figaro-setting of The Barber of Seville (1782) was used as a stick with which to beat Rossini’s opera on the same subject, premièred in the year of the older composer’s death. He seems to have had an unfortunate habit of selecting texts which have attracted other opera composers. His operas available on record at one time or another include a Don Chiscotte and a Serva padrona. To this list of unwitting duplications must now be added La grotta di Trofonio. Paisiello staged this in St Petersburg in 1785 under the patronage of the German-born and Europhile Catherine the Great. Unfortunately, it came immediately into competition with Salieri’s setting of a variation of the same libretto, first performed in Vienna a couple of months earlier, where indeed it remained in the repertoire for some three decades. Salieri’s setting has attracted attention once again in recent times, since the music is alleged to have been an influence on the demonic music in Mozart’s Don Giovanni two years later. The tuning of the timpani in diminished fifths, contrary to classical practice, was moreover adopted by Salieri’s pupil Beethoven in the prelude to the dungeon scene in Fidelio. In reality, both these composers may have inherited these ideas directly from hints in the scores of Salieri’s own mentor Gluck, but they remain of interest. A recording of the Salieri score conducted by Christophe Rousset on Naïve was issued in 2007, but no longer appears to be available except second-hand at a ridiculous price of £60.00 for two discs from Amazon. It can be streamed from Spotify, though inevitably shorn of any supporting material. It has to be said at once that Paisiello’s operatic treatment of Trofonio has no truck with any of Salieri’s bold innovations. Indeed, the sombre philosophical undertones in the libretto which inspired Salieri were actually removed by Paisiello. His chosen texts retain just the purely comic elements, resulting in a plot with suggestions of Cosi fan tutte, but shorn of da Ponte’s psychological depth and encumbered with the usual farrago of buffo plot complications. Nevertheless, the extensive booklet notes for this issue do their best to convince us that the opera deserves further consideration and sympathetic investigation. It is clear from the arguments of Luisa Cosi (extending over five pages or so) that Paisiello gave considerable thought to the structure and cohesion of the score; this is not just an assemblage of opera buffa numbers. But we really need a complete text and translation in order to follow the course of the action; one is indeed available online from the Dynamic website, but the translation baffles as much as it informs. In the booklet itself, the uncued synopsis by Fiorella Sassanelli (in Italian and English) does not even provide such essential information as the range of the individual singers involved, although it does find room for a complete listing of the individual players in the orchestra. The only singer in the cast with any significant past recorded history is Roberto Scandiuzzi in the title role, although his part is not generally prominent. He still has plenty of body in his voice, even when he seems to regard Trofonio’s cave with a positively Fafnerian sort of relish. But then none of the soloists ever seem to consider singing quietly, and they often blast away in competition with each other in the many concerted numbers. Their delivery of the divisions in more elaborate passages, too, is often imprecise; there may have been plenty of high spirits on stage, but all too little of this comes through on disc. There are also substantial acres of recitative, delivered without a great deal of urgency or indeed engagement. There are a limited number of opportunities for solo singing: the first, with the oboe and bassoon characterfully introducing and commenting in In udi que’ cari accenti, is ruined by some horribly unsteady and unsupported delivery from the piping Angela Nisi (CD1, track 8). She is even worse stressed in her Act Two aria (CD2, track 6), which is positively painful to listen to. Matteo Mezzaro in his aria seems to imagine that he is channelling the spirit of Mario del Monaco (CD1, track 10). Domenico Colaianni is brusquely imprecise in pitch during his Basta qui ragazzi (CD1, track 18), an aria which is alleged to anticipate Papageno but does so only in the most generic manner. One can understand the desire to remove Paisiello’s music from the suspicion of mere prettiness, but this is not an approach which carries real conviction. Benedetta Mazzucato in her musically disjointed aria Si vuol saper (CD2, track 14) seems to veer between soprano and contralto in an equally disjointed manner. Indeed only Caterina Di Tonno among the singers seems to approach eighteenth century style without putting on Rossinian or Verdian spectacles – admittedly the substantial finale which concludes Act One does sound very like early Rossini. The recorded sound is undesirably boxy, as can be heard from the very opening bars of the substantial overture (over five minutes in duration, and indeed the third-longest single track on either of these discs). Although there are seventeen violins playing in the pit, the sound is thin in the extreme – hardly the international standard of which the orchestra boasts in its title. Some of the playing, too, is far from secure; listen to the strings at the start of track 6, where they fail even to conclude their phrasing together. The recitatives are accompanied by a horribly clunky fortepiano which actually sounds more like a harpsichord in places when it acts as a continuo. The recording comes from a single performance, and there are noises of players turning pages as well as those emanating from the stage and audience. The latter interrupt regularly with desultory applause, and the conductor frequently rides roughshod over this when beginning the next ‘number’. The singers are far too close to the microphone to give a convincing theatrical balance. Indeed the recording generally sounds rather more akin to a 1950s mono radio broadcast than something emanating from the current century. 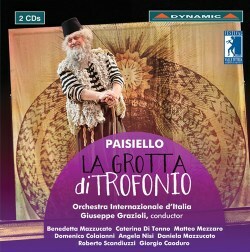 This is, in short, a release designed more for those curious about the music of Mozart’s contemporaries – who will welcome this world première recording (I do not imagine we will get another soon) – rather than for the general public who might potentially be converted to the music of Paisiello. It cannot otherwise be conscientiously recommended either as an opera or a performance, although I imagine that Catherine the Great would have enjoyed the music when the opera was new.